As with all of the Q-portfolio, Q-signage uses Letho as its underlying platform for the creation of content, broadcasting, multimodality, inputs, outputs and artificial intelligence. Use Q-signage by Quintetto on all types of displays from computers, LCD displays, display walls, LCD flat panels, Led tiles, and just about any type of display imaginable. 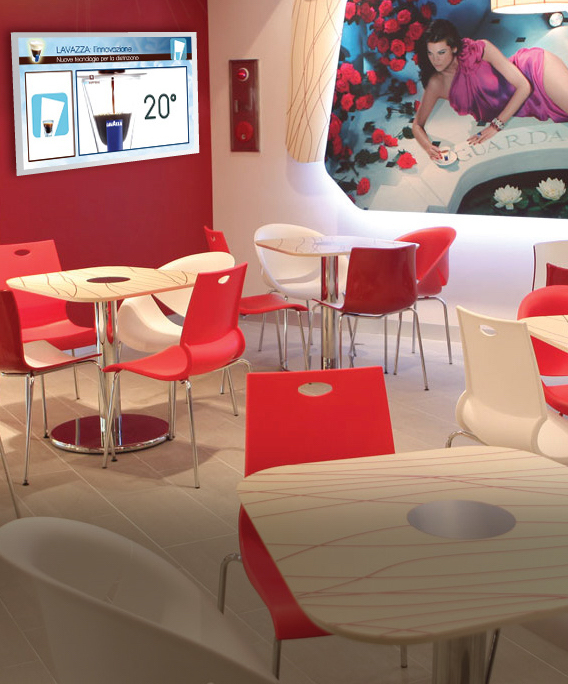 For an immersive experience in any environment, combine the Q-signage with SPACELESS. Distribute dynamic, engaging and interesting content that adds value to the user-experience. Q-signage organizes information, news, advertising, and personalized newscasting. Always available, at the time and place where the message is provided. Users can interact using multiple in- and outputs. The Letho platform is a multimodal interactive communications platform, especially created to facilitate the people-machine communication. The Quintetto customers can add just about any external device to the signage and receive big data in return. The input can range from cameras, displays, smartphones, speakers, electrical equipment, and just about any type of sensors available in the market. In addition to input given from Smartphones and browsers. The resulting output from Q-Signage can range from collecting big data to direct communication with the viewers. Quintetto prepares their customers for the smart city experience. Create personalized digital signage networks, tailor display-layout by dividing the screen into independent windows, add background colors, resize, and position the windows as needed. In each window, you can submit the preferred multimedia content. A simple and intuitive user interface makes use of extensive contextual menus, sophisticated user commands, drag & drop features and much more. Easy set up for unlimited number of programs that will be displayed according to the scheduling. Define schedules and set programming. The broadcast starts automatically at predefined dates and times. Enter text, images, audio-video clip, flash, feed, news; add time-delays, transitions, animation and interactive elements. Each display will broadcast scheduled content according to the aforementioned parameters. Control transmissions on each display and verify the correct functioning of the network via diagnostic reports sent in real time by each player. Get detailed information about the number of visitors / clients who attend a presentation and learn about who is focusing on specific content (age, gender, etc) when and how long. Provide demographic and behavioral information that will help you establish more stable and deep relationships with the end-user. Analyzing this data will allow for an accurate assessment of the impact of the message(s). Improve the efficiency of your services and thus the profitability of your business. Benefit from increased know-how, such as the data about your customers’ habits, tastes, preferences, age, gender, time-spent and general understanding of your message. Q-signage is a turnkey cloud-solution. Software updates, changes and new versions are automatically distributed and installed in the players across the globe. Q-signage constantly monitors the correct functioning of your network, displays, PCs and connected devices through a series of reports processed automatically by Letho. It periodically registers and all transmissions that are aired on individual displays for verification and reporting down to each individual monitor or display within the network. Intelligent digital signage by Quintetto is powered by Letho.